« Tissue MicroArray » (TMA) makes it possible to apply a large number of labels on a collection of tissues, by reducing the costs and handling time. This technique is particularly suitable for the screening phases. Our team makes paraffin or frozen blocks consisting of different tissue cores (TMA block) for performing multiplex histological analyses. 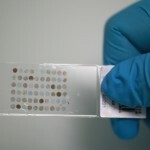 This technique requires great expertise and enables tissue screening using a single slide. These methods can be used to screen different tissue biomarkers and to select them based on their relevance. They are also often used to study and characterize the specificity of therapeutic antibodies. Lastly, the TMA techniques can be used to characterize collections of specimens (xenografts, tumour samples, etc.). In order to meet the requirements of analyses suited to this technique, Histalim has developed software tools for studying virtual Tissue MicroArray slides (slide scanned by a scanner). It is now possible to cut each spot of a slide with its markups, to distinctly number it and to apply image analyses for each one, etc.